The proposal is facing backlash from local Republicans. FAIRFAX, Va. — The Fairfax County Board of Supervisors is looking into creating a $200,000 fund to help immigrants facing deportation proceedings pay for legal representation. It would benefit both legal and undocumented immigrants. Current law does not mandate that all low-income individuals be entitled to a public defender during immigration proceedings. But the program is facing strong push back from local Republicans. 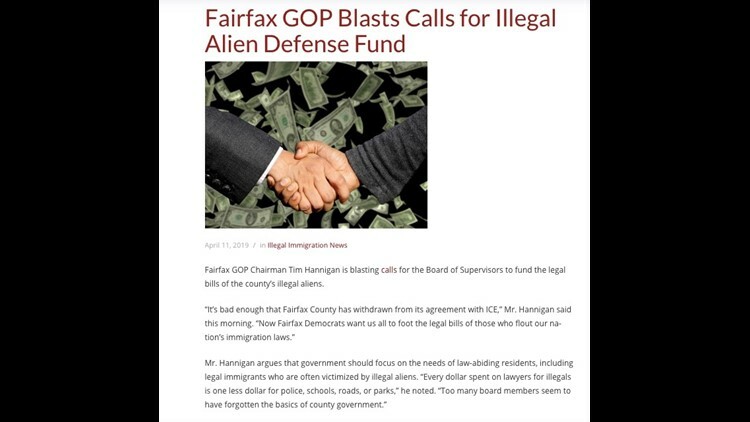 The Fairfax County GOP blasted a proposed legal aid for fund to help immigrants. "We're spending money on people who have violated the law, and it just doesn’t make sense," said Tim Hannigan, Chairman of the Fairfax Republican Committee. The program would be tax-payer funded. "Every dollar that's spent on that kind of support is money that's not put into roads, parks, law enforcement," Hannigan said. Activists argue everyone should have a right to due process. "Everyone should have the same rights," CASA spokeswoman Lizette Olmos said. Olmos cited a University of San Diego study that recently found 60 percent of Fairfax voters support universal representation. According to CASA, which helped launch the proposal, Fairfax would be the first jurisdiction in Virginia to implement such a program. Both sides say the fund will inevitably become a campaign issue in the upcoming elections this fall. The Board of Supervisors will vote on the proposal on May 7.